Lucy Kim, Auto-Synthetic (Wooden Birds) , 2018. Oil paint, urethane resin, fiberglass, epoxy, spray paint, powder-coated aluminum frame. 37 x 23.5 x 3 inches. Photo: Tony Luong. Courtesy of the artist. © Lucy Kim. When Lucy Kim and I were roommates while attending grad school at Yale, she molded large sections of our apartment in aluminum foil. She prepared big sheets of aluminum by joining the narrow strips from standard kitchen rolls, and, while wearing gloves, she would create delicate rubbings over wainscotting, tile, appliances, shoes, and other objects around the apartment. The immediacy of this dogged rubbing process stuck with me as embodying Kim’s insistence on engaging physically and materially with her subject matter. 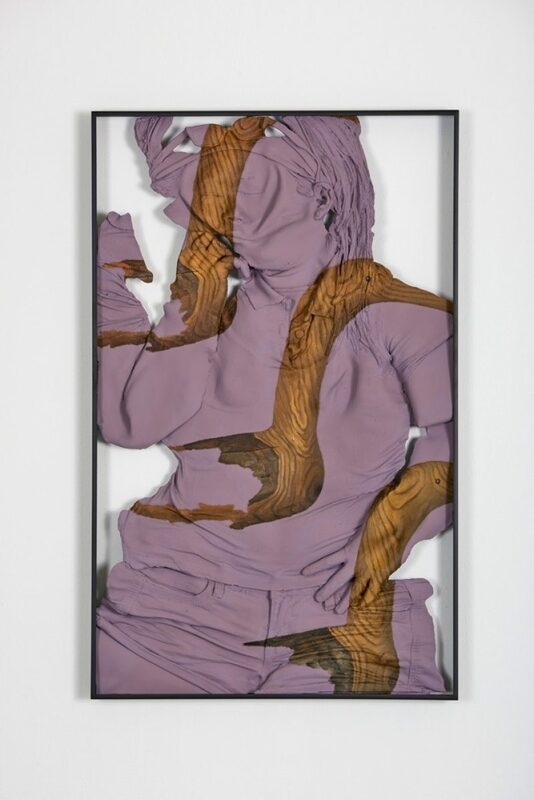 Currently, her work is on view in two group shows that relate figuration and historical narrative: States of Freedom: The Figure in Flux at Tufts University Art Galleries, and Classic Beauty: 21st-Century Artists on Ancient [Greek] Form at Providence College Galleries. She has also been invited by the Broad Institute of MIT and Harvard to be an artist-in-residence starting this fall where she will engage with scientists to learn about their research and relate it back to how the human body is imagined and visually represented. Leeza Meksin In your recent work, you’ve shifted from using body parts that felt anonymous to making casts of very specific people. Can you talk about this shift and how your new work relates to the historical genre of portraiture? Lucy Kim I use mold-making and casting in my work because I see it as a sculptural surrogate for photography: it has the authority of a record, but it’s literally more thing-like. In the past, I mainly used fragments of the human form, which is what makes them feel anonymous even though I often mentioned the model’s name in the title. About three years ago, I wanted to start cranking up the pressure of these casts as records. I began thinking about identification in the public realm: passports, driver’s licenses, mug shots, etc. It’s from this context that I accidentally veered into portraiture. LM You’ve now cast a geneticist, a plastic surgeon, and a personal trainer. Can you tell me more about these decisions? LK I wanted to use the bodies of people who manipulate the human body for a living. At first, I was also going to include people whose occupations indirectly affected the human body, for example, those in the legal and psychiatric professions. But in the end I opted to stay literal because it quickly collapsed into almost everything mattering, which then became a “so what” situation. It became important that the manipulation was of actual bodily material. Specificity is usually more open and accessible than the general, in my experience. LM Can you elaborate on how photography relates to your work? LK First, I’m interested in its use as a documentary tool—as record, evidence, and proof. Second, I’m fascinated by the way it naturalizes the transition from subject to image. That transitional space is what I want my work to engage with, which is why I substitute photography with its more materially and physically aggressive counterpart: mold-making and casting. The distortions—flattening, stretching, cropping, enlarging—are much more awkward, comical, or even violent when performed literally onto a thing, especially since I tend to eliminate all structural integrity like bone structure and focus mostly on surface information.